I'm not sad to see this year go. It's been a Tale of Two Cities, kind of year, "It was the Best of Times, it was the Worst of Times". But without the pain and sorrow of this year, we wouldn't be able to Praise and Celebrate the Joy that is coming in 2013. So in honor of that, I put together kind of a most significant top pictures from 2012. 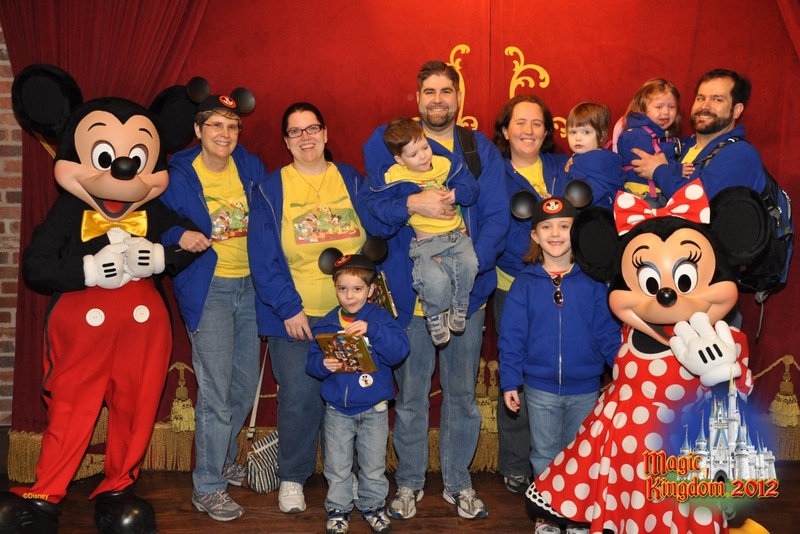 January 2012 - Our family joined my best friend's family and we all went to Disney World. 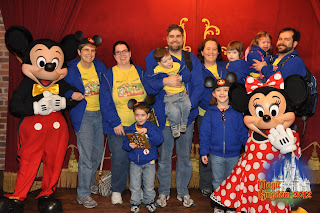 Our first day in the parks, we even talked Mom Willman to coming into Magic Kingdom with us. It was a Wonderful gift to be able to celebrate our good health - Chris conquering his colon issues, plus the births of 3 healthy little ones. We were healthy enough, that Kathleen and I were able to run (well, we didn't run the whole thing) in the Disney World Family Fiesta 5K, and then Eric ran the Donald Half Marathon and the Mickey Full Marathon, achieving the Goofy Challenge. Yeah, that man of mine, he sure is Goofy. Christopher started Dance classes, a gift from Aunt Lisa and Nana. We had spent half of January sick, being healthy just long in December and January to celebrate Christmas and go to Disney World. They opened up an Orange Leaf right around the corner from us right before the holidays. So in January, I introduced my husband to it, and corrupted my children. This was one of my favorite pictures of Sam from the month of January, a tickle fight in the Orange Leaf that Eric captured. Pure Joy. I just love spending Valentine's Day with my sweetboys. Don't get me wrong, Eric and I love a date night, but when I think of who I want spend special holidays with, it's my family that wins. So Mom W. watched the boys so Eric and I could have a non-valentine's day datenight, but then on the date in question we all went out for heart shaped pizzas at Monical's with the Julius's. 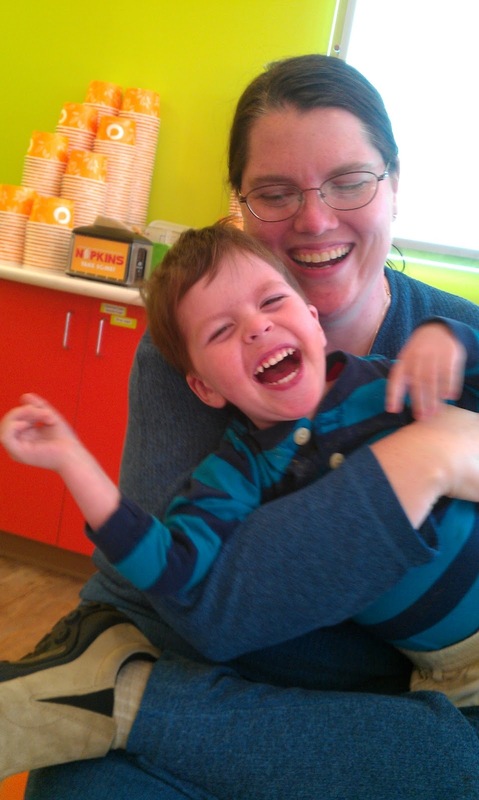 Christopher started being a car rider in February for a bit for misbehaving on the bus. It was supposed to be a punishment, but really I think Chris liked it. Honestly, in the mornings, I didn't mind it either, it made for some nice Quality Time for us. I just hated that pickup for car riding starts in the middle of naptime. Sam and I get a lot of Quality time while big brother is off in school usually. March 2012 - On the last day of February, Fina, our wonderful 14 year old Boxer baby was diagnosed with cancer. She'd had a mast cell tumor removed from her tail stub in December, but we thought it was isolated, and that the wounds on her feet that flared up in January were just some sort of rash/allergic reaction. But the varying antibiotics we were trying weren't working. So Dr. Dan sent me to a very expensive doggie Dermatologist. He looked at Fina's feet and thought they might be cancer right off. He biopsied them, and it confirmed his hypothesis. Her type of cancer does not respond well to chemo, so we decided to just make her as comfortable as we could until she indicated she was ready to go. First we started her on an antibiotic, because her wounds were festering, and a steroid to reduce the irritation and swelling, and a narcotic for pain control. She was like a new dog. But she'd still chew on her toes all the time. So we ended up getting her a cone of shame. This picture is Fina in her cone of shame, and Sam pretending that he's Fina. In February, we got a warm snap of weather, it was up in the 60s! Good enough for boys to go out and play! Also my "Baby Boy" turned 3. He told me he wanted a Care Bear cake, his yellow Funshine bear from Aunt Lisa from Christmas was the inspiration. I'm so proud, and kind of sad at the same time, I really can't call him my baby anymore. 3 is really a transition into Big Boy. April 2012 - At the beginning of April, my brother in law got to come home from Afghanistan for 2 weeks. It was his Spring Break. I got to play with them, going to the zoo, and visiting my Dad, celebrating Easter. It was a Wonderful visit, albeit too short, before he had to head back to Afghanistan. But I took a bazillion pictures while he was here, and put together a tiny flip album for him for the trip back. Having those pics of the girls and James made us all smile as we prayed over him over the next few months. Happy Easter from Us! He is Risen! He is Risen Indeed! During April, Fina continued to deteriorate. She started having more trouble going downstairs. We had to up the quantities of drugs she was on, we added prednisone, so she'd feel better. But it got to the point, even maxing out the narcotic didn't help her. We could tell when the drugs wore off. She started losing control of her bladder and bowels, and it was obvious it upset her. One morning, the 17th, she peed on the floor and pooped in like 3 different places. I asked, as I did every time one of us stepped in it, Shall I make the call? I knew I would never be ready (or want) to make the call to our friend Dan, who was going to put her down. And Eric said yes. So we did, I drove her to the vet, stopping at Starbucks for one last pup cup on the way, and had her put down. But it was the most peaceful end, more than I could have imagined. We had another one of those gorgeous windy spring days, and the tech put out a blanket outside, Dan had the stuff in his pocket, and we all curled up on the blanket, and she sniffed the air, taking notes of all the news on the breeze. Dan did his thing, and she just fell asleep. I was so Grateful to be with her. I was there the first moments she came into our lives, and I needed to be there for her as she transitioned into the next phase. She was my first baby, my fur baby. And she kept me sane during many times little else would have. But I miss her. Every day. Even still. April taught me one thing. I am not a woman cut out for living in a dogless home. 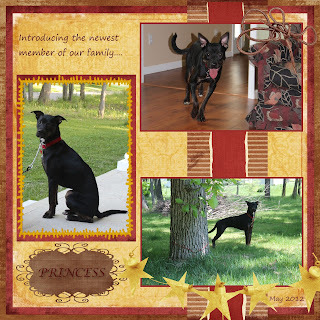 As May began, I began to creep out of my shell of mourning, and start looking for a new dog, to be a new member of the family. I used petfinder.com, and found a dog named Princess that sounded promising. We invited her over for a visit. She peed everywhere, she'd been abused, she was afraid of Eric. But the boyz and I all loved her. Even skitchy as hell, we still fell in love with her. We decided to do a two week trial. Christopher had his Dance Recital for Dance Class. He was a dreamboat! And what a Ham! If Dance class had been up on a stage the entire time, he would've done much better throughout the whole season. Perhaps, theatre is more his thing?! Mother's Day and my birthday, May is one of my favorite months for spending time with my sweetboys. They got me a hammock to relax in out in the backyard. But I don't seem to get much alone time in it. Someone or other keeps wanting to crawl in with me. And I'm Perfectly OK with that. 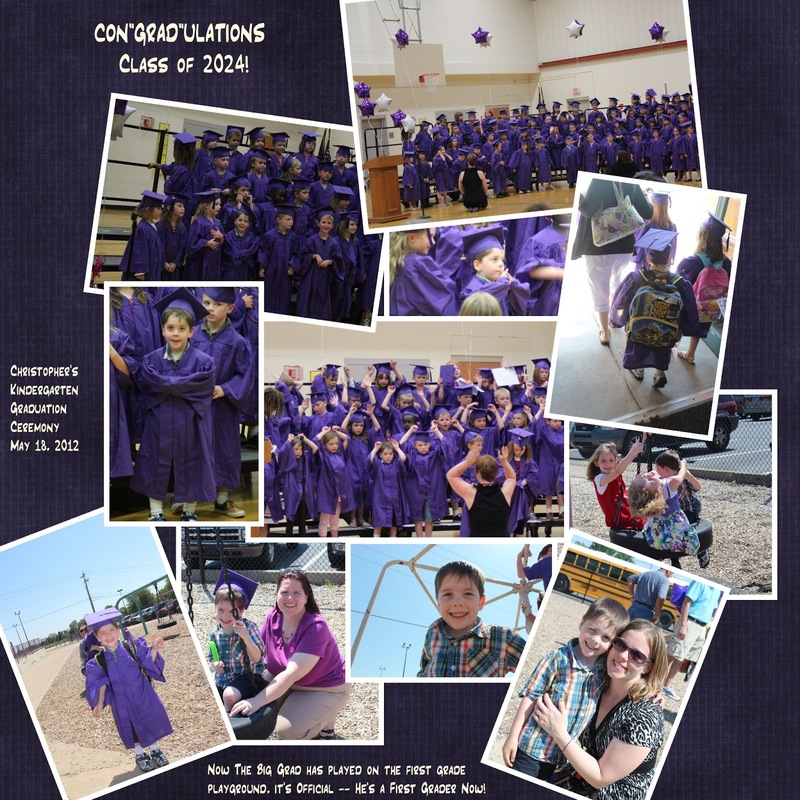 And at the end of May, Summer Vacation began, as Christopher graduated from Kindergarten. I loved his teacher, I love his school. He is Blessed to go there. So of course, I blubbered like a baby when he 'graduated'. 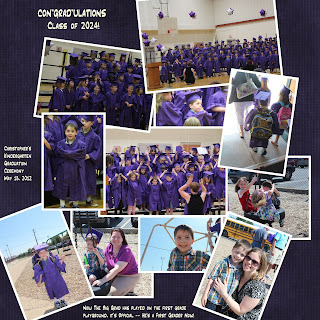 Kindergarten graduation is hard enough, don't know what I'll do in 2024! Now he's a big First Grade boy! June 2012 - Welcome Summer! It was Hot in June. Really spring hit early this year, so summer hit with full blast once school was out. The boys got their summer 'do's (ok Daddy took them to buzz it) and we enrolled them in Swim Classes. Every year we put them in swim classes with Indyparks at Northwestway. We love their staff. This was the first year we didn't have to get in the water with anyone, as Sam was old enough to be in the preschooler class, and Chris was in the big kid class. They're getting so big, and really beginning to find Joy in the water. As much fun as summer is, this one got off to a sad start, when Eric's grandma passed away. She had broken a hip, and during her recovery got an infection that took her surprisingly fast. It was good to see the whole family, and a lovely service, we hadn't all been together in a while. Aunt Teri and Grandpa stayed in town for a while to help get things taken care of, and it was nice to spend time with them. July 2012 - For us, July started off with a Bang! We left on the 4th of July to go up to Wisconsin for a few days. We spent 3 days with our friend Nancy at the family lake house on Lake Camelot. Then we got to participate in our friend Bohl's wedding for a couple days at her family lake house. Boy could we see why our friends love Wisconsin. Beer, Cheese, Brats, Lakes, Trees, it was Heavenly! And since we'd really taken our big family vacation at the start of the year, doing this short vacation up to Wisconsin. It was the Perfect summer break! In addition, my sister's girls were off on their summer break too. So they got to come down for slumber parties periodically. I think we got too used to having Aunt Lisa and the girls come down for a slumber party, Lisa would use her extreme cooking skills to make something scrumptious. And the kids would play until they Dropped. At the end of July, were the 2012 Olympics in London. We held a party with our best friends the Julius family, and we put on our patriotic garb. Who knew that these Old Navy shirts I bought for flag day would get so much wear!?! We had a British party - where we served up Tea and "Biscuits" aka cookies, and then dinner was Fish and Chips, (hard) Cider, some mysterious Beans that tasted like baked beans to me, but it was good. We did some silly crafts, and had a wonderful time. And we watched the Opening Ceremonies until the kids were blithering. I love that the Olympics are 2+ weeks long! One of my favorite times of the year. Good times. August 2012 - Summer ends. School started early this year. Christopher started on the 2nd of August. He was so excited though, and very ready to begin First Grade. For me, it has been and adjustment. The teacher is completely different than last year, but it's obvious she loves my son, and she loves her job, she just doesn't use parent volunteers as much as I was prepared to be there. I guess it worked out in the end, since I wouldn't have been able to volunteer as much as I wanted anyway. But wow, First Graders are very grownup. Christopher matures more daily. And he exceeds my expectations in so many ways. I am so Proud of him. 2 weeks later Sam started preschool. Yes, my baby is a big boy now too. He goes to a local church preschool for 3 hours twice a week. He loves it. And the staff is so wonderful with him, I couldn't be more Grateful. One of the biggest Blessings of the year, was being able to welcome my brother-in-law James home from Afghanistan. My sister had a wonderful Welcoming party at the airport, there were lots of people, and we made signs, and we embarrassed him thoroughly. What really struck me was as he we were waiting, he had let Lisa know he'd just gotten off the plane (was last off, politely letting everyone else off before him) when Strangers stopped and waited with our group. When he showed up, we started cheering, and so did the strangers, clapping, cheering, even coming up to James to just say Thank You. It was one of the most powerful moments in my life, it's really something to see what these families sacrifice for our Freedoms. And what a wonderful Joy when they come home safe and sound! Thank You James! One of the biggest celebrations this year, although we didn't realize it at the time, was the Celebration of Mom and Dad Willman's 40th Anniversary. We planned a giant family vacation to Florida for October, but we all found ourselves available on the actual date, so we threw together a dinner party for them. We even picked out a cake, for them to cut, just like the same day 40 years earlier. What a fine family to show for their 40 years of effort! Congratulations Mom and Dad! And this picture, well, I just loved it. One last semi-spontaneous trip to the park while the weather was nice. And the boys were being sweet, with eachother, at the same time. I had to snap it. I started out the month of September doing something I had never done. I left my babies for 4 days! Blessedly, they were well taken care of by Daddy and Grandma. But it was very weird for me. Especially because I wasn't necesarily "child-free". It's not like I went to Vegas or something. No, I helped my sister move to Texas. James had safely returned from Afghanistan, and he had to report to work in El Paso, so he took the moving truck, and I joined Lisa and the girls on a plane, and we girls all flew to El Paso. I got to see their new place at Fort Bliss. They literally live just behind this giant tank on the corner, and bordered by mountains, it was lovely. Weird compared to Indiana, but Lovely. Meanwhile, back in Indiana, it suddenly became Fall. In the most surreal event of our year, our niece Kaylee was diagnosed with Leukemia. That has stopped the hearts of all of us, but at the same time our girl is still here. To see her Fighting, Conquering, and Still Strong inside really shows how Powerful God's Amazing Healing Powers truly are. While we were visiting the hospital when Kaylee was sick, I started to feel sick. You know, girly sick. I needed to call my doctor, but I knew the first question she'd ask would be if I'd taken a pregnancy test. Imagine my surprise, when I took one....and it was Positive. Amidst all that fear and sadness, God chose to Bless us with Baby #3! Still in shock over finding out we were expecting, we went to the doctor thinking, maybe we were 5-6 weeks along, At Most. Nope. 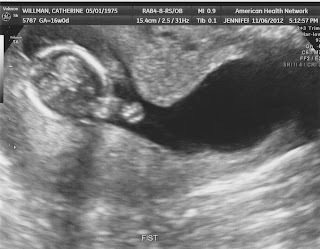 There were arms and legs on our little wiggling one, and they estimated me at 10 Weeks Pregnant! Seriously! I just lost a month...a month of crappy morning sickness, woohoo! And my due date became May 5, 2013. 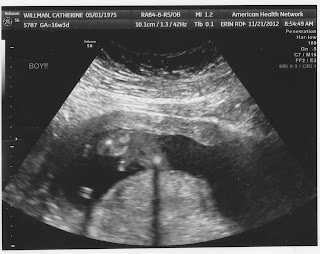 And we learned we are getting a nephew - Ryan and Amy's baby #3 is going to be a boy and due in early March! Now just as quickly as news of Baby #3 came, so did the sickness. Only with this pregnancy, it was monster bitchin' evening sickness. At which time, we took that trip to Florida with Eric's family that we'd planned. It was a Wonderful trip. Our little group of 4 drove down through KY, TN, GA into Florida. We stopped at some nifty places on the way: Lookout Mountain in Chatannooga, and Coke World in Atlanta. We also got to stop and visit with Eric's Grandpa just outside of Orlando on our way to the Club Med in Port St. Lucie. However, I was sick as a dog most of the trip. Luckily, I was able to take advantage and get 2 naps on a couple days. Ryan, Amy and Kaylee stayed in Indiana, but Alexis flew down with Karl and Erica and we got to spend more time with them than we had in months. The Club Med was lovely, the staff were very caring and attentive. The pools were so relaxing, the weather just right. I survived on french fries and ginger ale. But I started to lose the ability to do much physically. Taking flights of stairs wore me out. By the time we were headed back north, I had caught some sort of head cold too, turns out I got a sinus infection and a dash of bronchitis. And when you're pregnant you can't take anything good...so I didn't get any good drugs until the week we got back. That didn't stop us from having fun though, we stopped off in Pensacola to visit a friend of mine who'd had a baby, she recommend we take a little beach break. It was my favorite stop along the trip. Our quick little swim in Pensacola Beach. Someday, we'll go back! Fall Break was 2 full weeks for Christopher. And by the time we got the kids back in school, it was time for Halloween! The boys dressed as Green Lantern and Aquaman for Trick-or-Treating this year. They loved their superhero costumes. Since October I had been feeling crummy, but in November, that got kicked up a notch. The dash of bronchitis that was impeding my ability to run or do stairs, was getting in the way of doing anything. 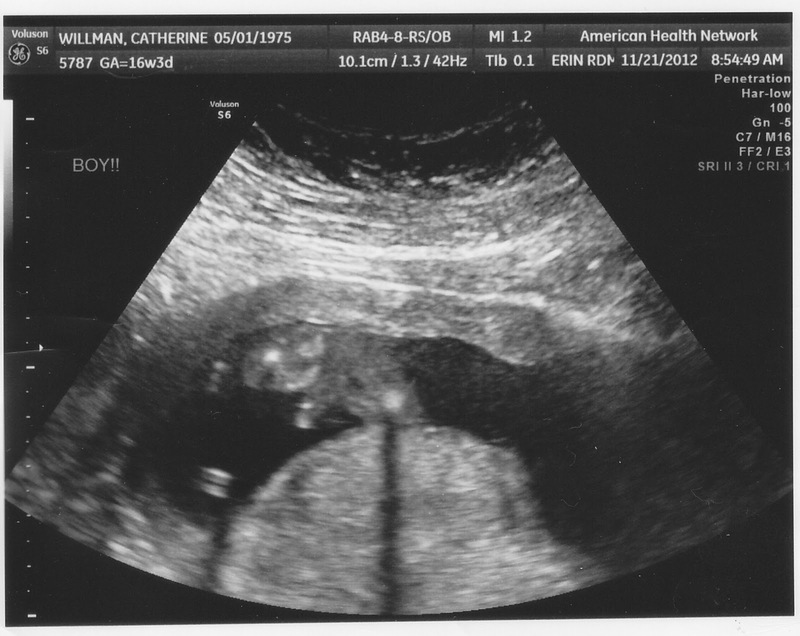 TI went in to the OB, and they took an ultrasound. 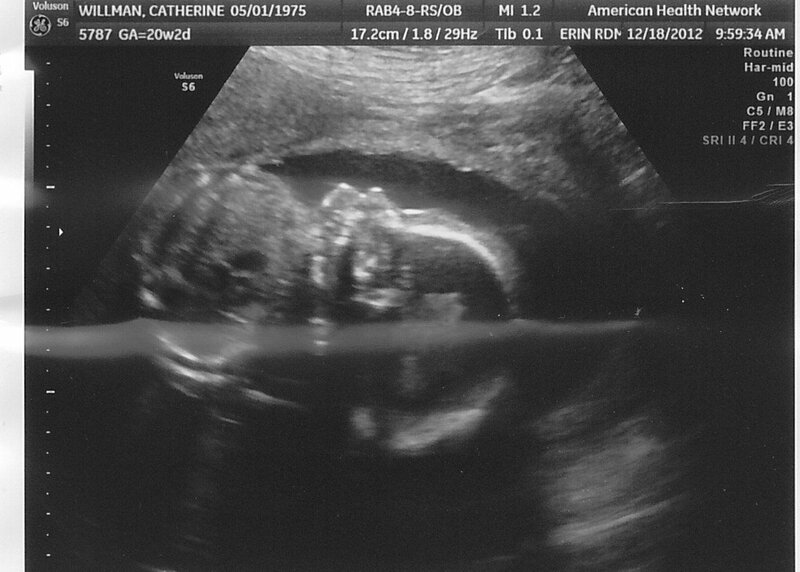 Baby looked wonderful, was wiggling all over the place, and they got a neat picture of the hand in front of the face. I just loved this picture. The baby was fine. I was just tired, must be that I'm older this time around. And I'm still recovering from that sinus infection or something. Then days before Thanksgiving, I started having bad cramping, and some spotting. I went in and they did another ultrasound. They told me that I should take it easy, that I had an Irritable Uterus, and a tiny tear in the placenta. They said, don't do anything over the holiday weekend. OK. I can do that. I continued cramping and spotting all through Thanksgiving. 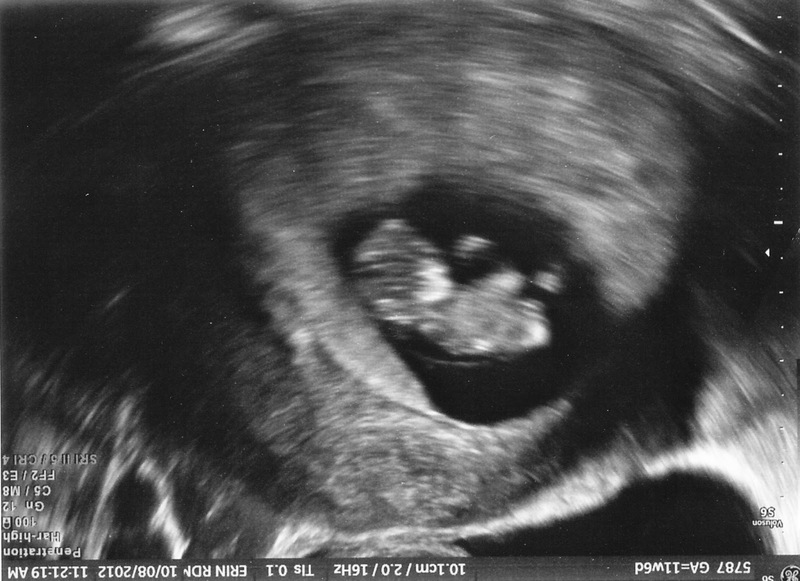 The best part of that ultrasound was that our baby gave us Quite a Show! Yes, it is a Boy! So we announced to our family and friends on Thanksgiving that It's a Boy! Thanksgiving was a great holiday for us, I didn't do much but park myself on the couch, because I was contracty off and on, and didn't want to overdo it. I didn't overdo it. I just had fun with our family. Happy Thanksgiving! Love Chris and Sam. After Thanksgiving, I tried to resume my regular activities, and ended up bleeding again. They said the tear wasn't healed, and it wouldn't heal for weeks. So they really meant Take It Easy. So I ended up on Moderate Bedrest. At 16 weeks. I can sit, I can lay down. I am home. Technically, I can drive, but I can't do much when I get to a destination. And I can't really do much around the house either. Doing nothing doesn't set off contractions and spotting, so Nothing it is. Gonna be a long pregnancy. It was a weird holiday season this year. My mother in law was sick, I was on bedrest. We did most of our shopping on the internet, or relied on friends to pick stuff up for us. The kids were the only ones with energy. The Baby kept giving me heart attacks, I'd cramp and spot, or something, I was in every week for 5 weeks getting checked out. And every time, the baby was fine. I'm the hot mess. Doesn't he look wonderful. Each time I have them confirm, it's still a boy, and that there's really only one in there. Because my symptoms really make me feel as though I'm already 100 months pregnant, when this picture was taken at only 20 weeks. He's looking great though. Growing wonderfully. So they say, keep doing what we're doing. I have to stay on moderate bedrest. The tear is healing but not healed. I figured that as I'm still cramping and spotting, but they say it can take weeks to heal. So be it. If what I'm doing is working, then I'll keep doing it. I have been getting very frustrated at my body not doing what I want, or with people not doing what I want. But for once, the baby, he's doing what I want. So I'll keep on keeping on! One of the best days (on which I did more than I should have) was December 21st. One of my favorite days ever, as it's Christopher's birthday. This year he turned 7! He wanted a Superhero birthday party, and a Super Karate cake. For his birthday, his Daddy and I signed him up for Karate Classes. He has proven he's responsible, and he deserves it. One of the best presents Eric aquired for me this month was a wheelchair. Eric found one at church that we could borrow without having to pay anything, so on Christmas Eve, he wheeled me (and the boys) into the Children's Museum to see Santa. And this time, Sam didn't freak out, and Chris talked to him, it was a perfect year for seeing Santa. And we were really Blessed to be able to spend the Holiday with our family. Like I said, It's been the Best of Times, and the Worst of Times. But without these times, we wouldn't be able to share the Joy that is sure to come in 2013. What a great way to end 2012! Our friends Emilie and Brian got married on New Year's Eve. We've known Emilie since high school, and her Dad used to be our pastor. Chris used to call Emilie, Big Obs (as opposed to his friend Emily, who is the same age, 'little Emily', or just Obs) and she lives in the same neighborhood as we do. This was the first wedding we've been to at our church, and it was just lovely. It was snowing gently, and the bride was beautiful, and the groom handsome. As it should be. Brian and his groomsmen take their places. Emilie and her Dad, Pastor Bill, come down the aisle. It was so beautiful. I probably stood a bit more than I should have, because by the time we got to the reception at the Rathskeller I was Done. We had table assignments, and Eric had brought me in my wheelchair, we got tehre pretty early in comparison to most of the wedding crowd, so we parked me in the corner, but once everyone had made it into the room, there was no easy way for me and my chair to get out. They had a buffet, with schnitzel and spaetzle! Oh my, it rocked! But unfortunately, Eric has to be my gopher in buffet lines, consequently he had to go through twice, once for me, once for him, by the time he sat down, I was mostly done. It was a bit of a bummer. Being "handicapped" at buffets or in crowded places is rough. I told him, when I'm healthy I want to go a swanky buffet, and fill up my own plates, and walk to the bathroom all by myself, and then fill up More plates. So there! We waited until my bladder was going to burst, and we had to leave. They had a "photo booth", but the line was so long, there was no way. I can't wait in any lines, it's depressing, and no one would want a picture of that anyway. We stayed for dinner and for the cutting of the cake and the first dance, but then we had to head out. My body was simply done. I wish I had the strength to hold out, and party like a grownup. Alas, no. On the other hand, the boys were having a great dinner with Grandma, Grandpa, and Aunt Teri. When we arrived at 10, they were camped out on the floor like a slumber party! Playing sweetly, and everything. I totally crashed out on Mom W's couch, which was way more comfortable than a wheelchair in a ballroom. And the boys held out. They started to Blither about 11:20, I didn't think they'd make it all the way to midnight. Sam was literally circling. You know how they say, circling the drain? Well, Sam was just circling the room, so tired, that if he stopped moving he knew he'd fall asleep. When both of them were moving, they were so clutzy they kept blamming into each other. So we sat them down next to us to watch the ball drop. I asked Mom if she had some sparkling grape juice, or wine for the occasion? Nope. No one had been feeling well enough to think of those things...until 11:45. So we did what we do best, we Improvised! Mom broke out the Diet Cherry 7 Up. (Hey, it's pink, it's sparkles, and in me and Mom's case, it's non-alcoholic!) She broke out her festive glasses and filled us all up, ready for the ball to drop. Even the boys, got their own tiny shot glasses of Diet Cherry 7 up. The last. Our last Christmas celebration. We usually do Willman Family Christmas on Christmas Eve, but our schedules didn't permit, then Kaylee's health didn't permit, then I thought our health wasn't going to permit it either. Chris had a little cough, and I just feel crummy all the time, and Eric's working an awesome sinus infection I'm pretty sure. But Amy had masks for Chris to wear, and when I asked him if he would wear a mask, or rather stay home. He chose the mask. He did great with it really, better than I thought, he just had a little trouble putting it back up when he wasn't eating. After a few hours, he said he wanted to be done. He still did a lot better than I would have thought he would. But when we explained Kaylee is sick, and she can't have any more cooties, especially his, he was eager and willing to keep his cooties to himself. We decided to get together for lunch after church. I skipped church (gasp!) so I could go see the Fam. And told Eric that I would call him if I felt up to going. As it turned out, skipping church and resting quietly at home all morning was just what I needed! When it came time, I was ready to go too! This year we kicked down our Christmas. Last year we were Blessed to be able to adopt a family to help out. Unfortunately this year, I was barely able to help myself. Most of our shopping was done online. So we agreed, that this year, we'd just pamper the kids. That worked. Honestly, watching the kids open their presents is my favorite part of Christmas now anyway. See? I'm so old. But you know what? Having kids, and seeing that Joy when they recieve a gift that they wanted so badly, or didn't even know that they wanted so badly, that makes all the holiday stress worthwhile. Makes all the holiday crazy melt away. That was just what we needed this year. And to hear the 4 of them all laughing at the same time, wow, my favorite noises! Daddy helped the boys open their presents. Christopher and Sam immediately had to open the Transformer Rescue Bots toys they recieved, and start playing right away! This is the present I made Lexi. A bearded hat. She had given me a wish list, but when I heard her volleyball team last fall was called the Orange Mustaches, I knew I wanted to make her a hat with a mustache. On fall break, I found out her favorite colors were, "in this order: purple, neon yellow, and hot pink". So I made a hat in exactly those colors (finding and shopping for yarn was tricky in my condition, it was also the last and only shopping I did for myself before becoming wheelchair bound in public), I was surprised at how much I loved the wacky color combination. It was all I wanted. I made the beard removeable using orange buttons and chains hidden under the hat, so she doesn't have to be a bearded lady if she doesn't want. Flexibility Right!? Exactly. But when she put it on, we all couldn't stop laughing, it looked so awesome. I'm so glad she liked it. I love this picture of Kaylee, putting on her new woobie shirt from Grandma, it was so soft, we couldn't help pet her. She kept singing "Soft Kitty" from Big Bang Theory. We mutated the words to be "Soft Kaylee, Warm Kaylee..." It was hysterical. Blessedly, the whole chemo/leukemia has not shaken her spirit, or dampened her Joy. She dug into Lexi's stick on mustaches, and put one one. Pure Silly Girl! Kaylee really enjoyed this silly microphone, and so did Sam. There was much Joy, much laughter. And it was good to just hang out. Though we got sucked into a Colts game, and I wanted to stay to the finish. I shouldn't have, I've ended up miserable all night, ankles the size of tree trunks, and contracty. But when I hear them all laughing in my head, the kids playing, all that beautiful normalcy, however temporary, well, it's worth it.